Writing the order of service can be very challenging. You will have to consider what elements you will include in your service, and who will in it. Before you get started writing, seek guidance. For more funeral order of service ideas, see our Sample Funeral Program Gallery. 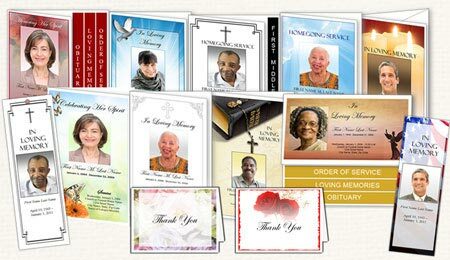 Your funeral director or church pastor or minister can help you create your order of service. They have arranged many services, and often have samples or guidelines to help you get started. Usually the church minister or the funeral officiate gives instructions about how the service should be conducted. They can ensure that their particular service protocol is followed. Make sure to coordinate with church officials as soon as possible to ensure that any specific and personalized requests can be incorporated in the services. Consult with the funeral director and get guidance about conducting services. Funeral Home personel can provided you with sample outlines of previous service, and give you an overall tour of their facilities so that you plan your service acordingly. You have the most flexibility. Just make sure that your venue (parks, restaurants, community centers can accomodate you for audio/visual equipment (if needed), microphones, slideshows, etc. 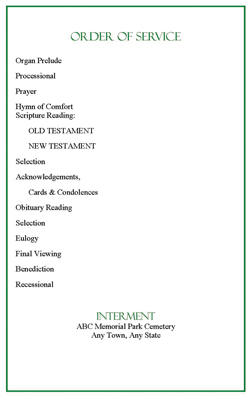 Information that may be in an order of service or funeral program outline. Once you know what the elements of your service will be, you will have to determine how will do what in your service. You will need to list the names of the Pastor or Officiant, names of funeral readings and scriptures, the name of the Eulogist and any other formal information. You may want to limit the use of specific names to minimize last minute changes that may occur. Consider writing "musical selection" or "tributes" instead of giving the secific name of the soloist or person giving comments. You can consult the internet to find different samples of funeral orders of service to give you ideas on how to type it. There are no hard rules about what format you should use, as long as it is easy to follow. You may consider sending a draft to the church or funeral director before you publish it in your program.